I may be about to write blasphemy, but don’t the ingredients in Deviled Eggs gross you out a bit?! I mean 6 egg yolks and 1/4 cup mayonnaise for 12-half eggs seems a tiny bit excessive to me. And if you are Paula Deen, you also add bacon on top… but I digress. 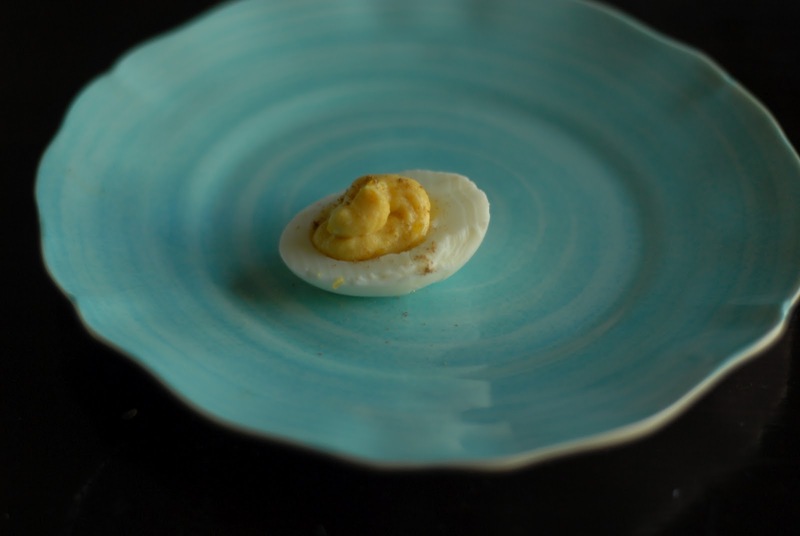 I decided to try and find a healthier alternative to deviled egg filling using Greek Yogurt and Dijon Mustard, and I thought they came out pretty tasty. splash milk (to smooth and thin out the consistency of the filling). Boil 6 eggs and cut in half. Discard half of the yolks and mix the remaining yolks with the greek yogurt, dijon mustard and celery salt. Add milk until desired consistency is reached. Spoon, pipe or squeeze into egg white bowls. Dust with paprika and serve! I thought they tasted pretty good! I liked the tang that the Greek Yogurt gave them. Sorry for the worst photo ever, but we were moving and I didn’t have my phone or camera handy, but liked the post… hopefully this won’t happen again. Previous Post Butternut Squash Spoonable Cornbread! Next Post Rocco DiSpirito Inspired Meatballs! Hi! And thanks for stopping by. Here you'll find *mostly* healthy recipes with the occasional fun family adventure blurb or short exercise circuit.